This adapter features a clickless 7-stop aperture ring with half-stop markings and a detachable tripod foot compatible with Arca Swiss, Markins, and Photo cam ball head tripods. Additionally, its matte black finish minimizes internal reflections so as to maintain image quality. Box Dimensions (LxWxH) 3.8 x 3.6 x 1.8"
Nikon G Lens to Fujifilm X-Mount Camera Lens Mount Adapter (Matte Black) is rated 4.3 out of 5 by 20. Rated 4 out of 5 by JeffTx from Works Well with Both F and G Nikon Glass on Fuji X-T10 Cost $39 more than base model but it includes an aperture ring which allows Nikon G lenses (without aperture ring) to be used on Fuji X cameras. Takes great pictures. Haven't had any trouble mounting or unmounting on lens or camera body. Good fit and finish. Takes some practice to successfully manual focus on Fuji's but that is a function of the camera; not this adaptor. Highly recommend if you want to make use of your old glass on new Fuji cameras. Rated 5 out of 5 by LEO JR. G. from Must Have Accessory for ex-Nikon Lens Users! Product quality is excellent. Mates with all the Nikon lenses I currently own to the Fuji X camera body with no issues. The f stop control is smooth, but wished it was in detent. This adapter matches with the lens intended for, giving it a smooth transition from the front tip of the lens to the Fuji lens mount, providing the lens and the Fuji body with a tight, perfect match. This mount adapter saved me a lot of $ from another Fuji lens purchase. Perfect alternative from buying a new lens. Planning tol purchase another copy very soon. Rated 5 out of 5 by Chessman from It works Use this with Nikon Dx lens left from old Nikon camera for my new Fuji xt-10. Of course there is no auto features so you must go to menu and set shoot without lens, then it works fine as a full manual lens. Rated 5 out of 5 by Scott O. from Nikon to X Mount Camera This is to adapt Nikon lenses to a Fuji X camera. Now that I have gone mirrorless, I can still use some of my special Nikon lenses. It works as advertised, and I haven't noticed any image degradation. The adapter is extremely well made, with metal mount surfaces and a fine finish. Highly recommended. Rated 5 out of 5 by Nelson from very good, muy bueno You can use all nikon lens but not the AF-P lens, no VR, no AF all manual. Good construction and very good quality. Puedes usar todos los lentes nikon pero no la serie AF-P, no VR, no AF. buena construccin y muy buena calidad! Rated 4 out of 5 by Anonymous from Set-up Confusion I rated it a 4 stars because of no instructions included in package. Since I am new to fugifilm xt2 I was not aware you had to set the camera to no lens for it to work. I eventually found this by looking at numerous internet resources. Hence for Fugi xt2: SetUp/Button/Dial Setting shooting without lens to on. My first set of trial shooting with my Nikon 105mm 2.8 macro has been good. Rated 4 out of 5 by 4x5 photographer from useful addition Does what it says it will, adapts Nikon G lenses to Fuji X. I got it because of Metabones reputation and the fact that it has both a tripod socket and, more importantly for me, an Arca-Swiss compatible dovetail so that the adapter can be mounted to the tripod directly. This takes a lot of the stress off the camera lens mount. This is really important with long lenses, the strength of Nikon and the current weakness of Fuji. I'd have given it 5 stars were the mount a bit taller. will this work with non G nikon lenses as well? Ai-s etc.. According this video: https://youtu.be/t2Wbys3NpdE this adapter can be used with G lenses and AI, AIS and D type lenses. 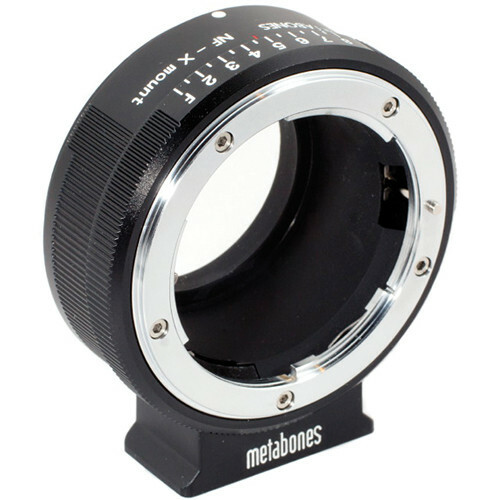 Just the lens aperture ring cannot be used - the Metabones aperture ring must be used instead. Asked by: JOSE R Q. Unfortunately, Metabones does not produce a Canon EF to Fuji X adapter. However, the FotodioX Canon EF Pro Lens Adapter with Built-In Iris Control for Fujifilm X-Mount Cameras B&amp;H # FOPFXACEI would be a suitable product. will this adapter work with DX type lens sigma 18-35 for nikon and the fuji xh-1 ? Yes, it will work with the Sigma 18-35mm, as it is in Nikon F mount. Lenses Nikon 24-70 2.8G and 85 1.4D can't focus at the infinity mark, using FUJI XT2. However they can focus when set a little bit to the right of the mark. Is this metabones adapter a bit too thick or detective ? I just received this adapter and don't see the click-conversion kit included as some info seems to indicate. It is definitively the new adapter style with the scale to 7, unlike the older one pictured here with the scale to 8. Should the conversion kit have been in the box? Thanks! Will this work with a Tokina 16-28 for nikon? Will this work on Nikon 85mm 1.8D Lens? Will the Nikon in-lens stabilization still work?